St Mary's Parish Church Iwerne Minster. new-comers. 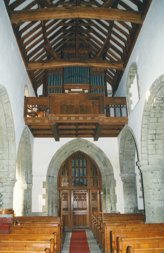 To find out more about our historic church please follow this link or go to this map to find us. 1st Sunday 9.30am Matins and 11am Holy Communion. 2nd Sunday 11am Holy Communion. 3rd Sunday 8am Holy Communion B.C.P. 4th Sunday 11am Family Service. On any 5th Sunday there is a Benefice service held in one of the 5 Parishes see service page for details. The History of St Mary. In 956AD a charter placed Iwerne and its five churches under the jurisdiction of the Abbess of Shaftesbury. Following the Norman Conquest, the Saxon church in Iwerne was pulled down, and work started on the present building around 1100AD. 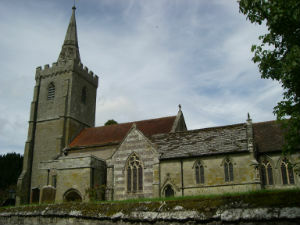 Hutchings wrote of the spire in his History of Dorse: "Of the three medieval stone spires remaining it is now the only remarkable one in the County". This ribbed spire is 60feet high, but it was more than halved in height during the Victorian period. The 14th century tower beneath it has a chiming clock made in 1690. The magnificent Norman archade, north aise and chapel provide clear markers of the church's ancestry, while most of the windows are 14th century; as is the chancel, which replaced an earlier one and is attributed to William of Wykeham. St Mary's contains some striking stained glass windows, notably that at the East End above the alter, which was designed by Christopher Whall and dedicated in 1920. Other remarkable featers include the fine organ loft and Walker organ, situated high above the nave in the West End, and the six bells in the belfry in the West Tower. These date from 1609, two from 1618, 1768 and 1904, while the oldest is one of the very few in the Country from pre-Reformation days and dates from 1310. Visitors are always warmly welcomed to attend services at St Mary's or to visit at their own convenience. They will find a booklet about the church and the village inside.